The Estonian government discussed at its Thursday cabinet meeting the issue of submitting the financing application for Rail Baltica to the Connecting Europe Facility and authorised the economy and infrastructure minister to sign the application, LETA/Postimees Online reports. "Rail Baltica is very extensive, strategically important but also expensive project, building which is only possible if we involve the financial support of the European Union," said Prime Minister Taavi Rõivas. "At the same time, modern high-speed railway is important for Estonia, Latvia, Lithuania, as well as the unity of Europe, integrating our region more closely with our allies and partners," said Rõivas. The Prime Minister said it is important that financing applications were submitted by Estonia, Latvia and Lithuania separately, as well as by the three countries' joint venture. "This way all the parties send a clear message that our goal is to build Rail Baltica as a common project." 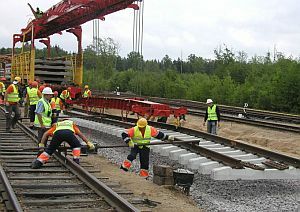 The up to 191 million euros support to be asked in the first application round will be used for the preliminary studies and thorough cost-benefit analysis for Rail Baltica as well as for purchasing the land on the railway's route. Estonia's share of the whole Rail Baltica project is about 1.3 billion euros, which is distributed over ten years. Applications for the next stages of the project can be submitted from 2017 onwards. In addition to Rail Baltica, Estonia plans to apply for CEF support for the extension of the Tallinn tram line to the Tallinn Airport, which is necessary to connect Rail Baltica to city transport. The deadline for submitting the application to European Commission is 26 February. The decision to allocate funds will be made taken in the autumn.